Handing someone your personalized business card might seem like an old-fashioned way of doing things, but it’s actually a great way to leave a lasting first impression. We’re so digitally-minded today that someone handing us a real-life card we can touch and put in our pocket is pretty memorable. But they’re far from just being memorable. Business cards also give recipients a quick insight into our brand and provide them with the details they need to get in touch with us. However, if you want to send the right message with your card, it’s important to get the design right. You want it to both show off the unique personality of your business and provide all the information your recipient needs. Personalized business cards are unique to you and your brand, and the benefits are pretty self-explanatory. Having your business card reflect your own personality and that of your business will immediately make it stand out in a stack of generic, same-y business cards. Most people make the mistake of thinking they just need to add their contact details to a piece of card for it to count as a business card, but these age-old tools need far more than just that. Imagine you’re the recipient and you’re flicking through a pile of business cards you picked up at an event. Are you going to remember all the cards with white backgrounds and simple black font, or are you going to remember the card that’s shaped like a star with embossed text? These days, people actively seek out brands they have a connection with. That means we’re more likely to buy from a business if it aligns with our values even if it costs us more than going with another cheaper brand that doesn’t quite tickle our fancy. 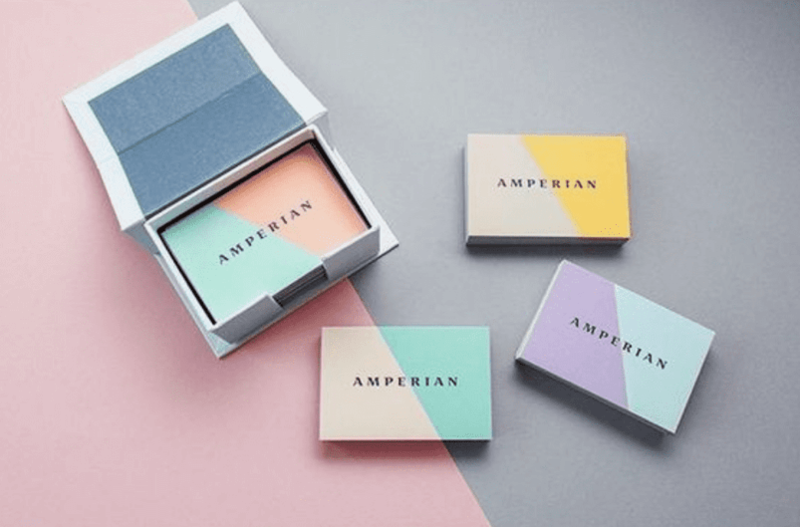 Your business card is a great way to show off the uniqueness of your brand by using quirky colors, patterns, card types, and more (we’ll go into detail about this in a moment). Taking it one step further than simply showcasing the unique personality of your brand, business cards also help you create deeper connections with potential prospects. If your card is well-designed and stands out, it’s likely to create a talking point between you and someone who might become a customer. What If You Have a Big Business With Lots of Staff? It might seem impossible to create personalized business cards for every single member of your team, especially if you’ve got a lot of people working for you. With Brandly, you can upload a template that’s personalized to your business and then have each member of staff login, access that template, and add their own individual details to it. This way you have a cohesive feel to your company cards but each member of staff has their personal stamp on it. Now you know how personalized business cards can help you stand out, start conversations, and make a great first impression, let’s take a look at how you can create them. It makes sense to include your logo on your business card. It’s an icon that quickly establishes your brand and will mean your cards are consistent with other collateral, like your website, documents, and social media channels. But rather than just slap your logo on in the corner, you can get creative. Try having it splashed across the card as the main focal point, or let your company mascot take center stage. This card has the brand’s signature moustache design as the focal point (which can actually be ripped out and worn). The logo is the feature point of this company’s business card. The company mascot takes pride of place on this design. Color is one of the quickest ways to grab someone’s attention and make them remember you. When it comes to designing your unique business cards, you want to find the careful balance between showcasing your brand’s memorable colors and creating an eye-catching design that stands out. Feel free to get creative here as well: use color on the edges of your cards, play around with different pairings, and use different font colors to build depth. These cards have been painted orange around the edges to give the otherwise simple design a splash of color. Using bright colors on a black background really makes this card stand out. Create a couple of different designs in different colors like this brand so that each recipient receives a different style. We’re so used to interacting with a screen that actually touching something and feeling the texture of it is somewhat of a novelty. You can cash in on this by creating a business card template that feels nice as well as looks good. These creative business cards double up as a stencil. Raised shapes make this business card extremely tactile. Or you can ditch the card altogether and opt for a completely different material. If you do this, you want to make sure that the material you use is relevant to your business. For example, if you run a business making soft toys for kids, you probably don’t want to have a business card made of metal or another equally hardy material. This business card is made from stainless steel and features a really nice cut-out design. By using colorful fabric as the business card base, this designer provides a tactile experience that really reflects her brand. It’s so ingrained in us that business cards are rectangular. But what if they don’t have to be? Imagine you’re the recipient of a handful of 10 business cards. Are you going to pay more attention to the 9 rectangular designs, or are you going to be more drawn to the 1 card that’s a completely different shape? Do anything you want here - try circles, squares, pentagons, or a shape that’s relevant to your business. This designer has gone for a hexagonal-shaped business card with a funky-color design. This business card is both circular and made of wood - how’s that for innovative? This cafe has gone all out and created their business cards in the shape of a coffee cup to reflect the main purpose of their brand. Business cards don’t just have to be business cards. These days people want to get as much value from businesses as possible, and that doesn’t stop with your business card. You can create a card that doubles up as a guide, a bottle opener, sponge, comb, or something else that’s relevant to your business. This brand has created a business card that’s also a pack of playing cards. This pub has created a business card that also doubles up as a bottle opener - handy. Your cards don’t have to double up as something else, though. Instead, they could simply be interactive so that recipients have to engage with them in some way. By getting handsy with your cards, prospects are more likely to remember who you are which is a win-win situation. Maybe you want to make it digitally interactive by incorporating a QR code, or maybe you simply want them to slide open an envelope to reveal the contact details of your business. This restaurant requires recipients to slide the contact details out of the “chopstick holder” to get the information they need. Maybe your business card turns into something else when the recipient’s done with the contact information, like this one that can be folded into a chair. Finally, let’s talk about one of the quickest and easiest ways to create personalized business cards - by making it all about you. This might mean adding a photo of yourself to your card, adding a few fun facts about yourself, or incorporate something that’s personal to you onto your card to help prospects make quick connections with you. This chef has added an illustrated portrait of himself at work onto his card. If you’re creating personalized cards for a team, why not add their personal photos onto their cards like this brand? Don’t feel boxed in when it comes to creating unique business cards. We’re so used to thinking that business cards should be rectangular in shape and professional through and through, but adding a splash of personality can make yours stand out and hold a lasting first impression. So get creative, have fun, and create a business card you’re proud to hand out time and time again. Sign up to receive our newsletter to get more creative tips on designing business cards and building a brand you love.